Kilsyth Rangers continued their miserable start to the season when they were thumped 5-1 at Rutherglen Glencairn on Saturday. It was a truly awful day for Rangers fans who went to Rutherglen hoping to see their team picking up their first league win of the new season. Instead they witnessed an inept performance from a side which looked as if they had never seen one another before; to an extent this was the case as only two of last years squad started the game and with several regulars missing it was always going to be an uphill struggle. There wasn’t much in the opening spell but it soon became evident that Glencairn were rather more likely to open the scoring and so it proved after just 11 minutes when Liam Gormley was allowed to run through unchallenged to fire a low shot past David Kane. Ironically this was the same player that Rangers had tried to bring to Duncansfield earlier in the week but he had opted for Rutherglen. Within another seven minutes he had added another when he picked up a loose ball which Kane failed to gather. The home side were certainly not shot shy and Jamie Hamilton, having already seen one long-range effort come off the inside of the post, fired home from 30 yards to give Glens a three-goal half-time lead which didn’t flatter them. They picked up where they had left off after the restart but the Rangers defence was looking a bit more organised and managed to hold out for a while. Kilsyth even pulled a goal back when Andrew McLaughlin scored with a low shot to the far corner. 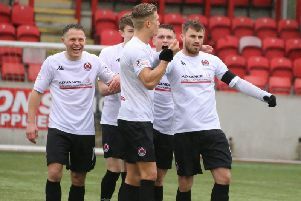 Very briefly it appeared that Rangers might actually mount a fightback but this thought was soon dispelled when Ryan McArdle netted a fourth goal for Glencairn. And near the end Hamilton was allowed to run through, again virtually unchallenged, to score his own second goal and the Glens’ fifth.